George Bellows (1882-1925), the great American artist particularly famous for the iconic boxing paintings Stag at Sharkey’s (1909), Both Members of This Club (1909), and Dempsey and Firpo (1924) was commissioned by the New York World to be at ringside for the Carpentier-Dempsey bout and record the fight through a series of drawings. 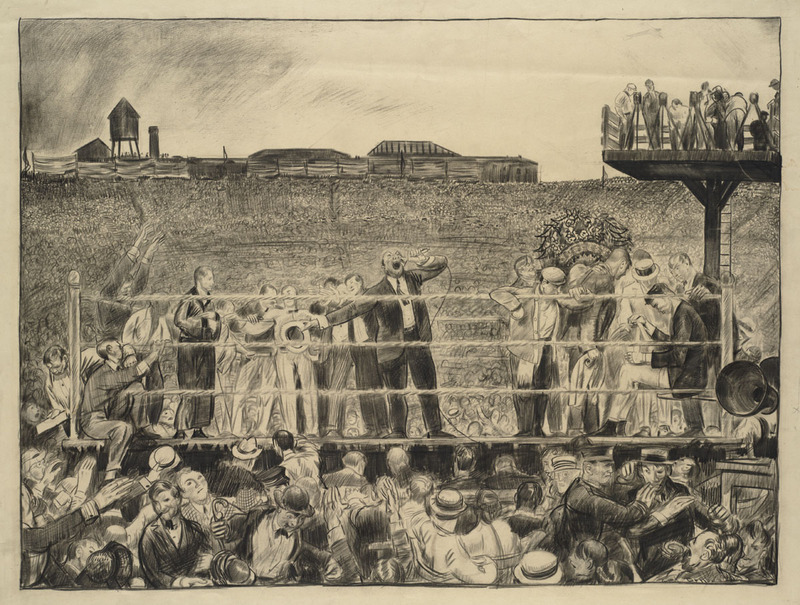 From Bellows’ ringside sketches, three stand-alone works of art resulted: two crayon drawings and a lithograph based on the drawings, all three virtually identical in their depiction of Carpentier’s introduction to the crowd. All three bear the title Introducing Georges Carpentier and date from 1921. The scene is a busy one, with straw-hatted spectators crowded into the foreground and numerous people in the ring; the most prominent figure is the ring announcer, who is in the process of making the introduction. Dempsey is on his stool, in his corner. Carpentier, recognizable by his signature floor-length, black-trimmed ring robe and sleek, fair hair, stands in his corner, which is in a corner of the picture. While these are of much greater interest as representations of the overall scene at Boyle’s Thirty Acres than of Carpentier or Dempsey, it is important to note the fact that Bellows chose to depict the moment of Carpentier’s introduction to the crowd, rather than a moment of dramatic ring action as he did for his representation of Dempsey-Firpo. The implication may be that Bellows knew that the interest of the event lay more in the hype surrounding it, and the reception of Carpentier that resulted, than in the fight itself. Carpentier’s being presented to the throngs of spectators was, Bellows seems to suggest, was the real high point of the afternoon. As art historian Linda Ayres has pointed out, his ring introduction was “the only moment of victory for [Carpentier] that day.” Perhaps Bellows was one of the many Carpentier sympathizers at ringside and wanted to portray his idol in his sole moment of glory. In any case, it is certainly noteworthy that Carpentier takes center stage (figuratively if not literally) in Bellows’ renditions of the event.